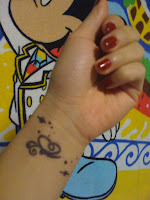 ***The picture: Just wishing to show a simple tatoo which I have been having for about 3 days and the red nail I just got this morning :) Love it! Look good bos ke. Let's have the real one!